“Therefore do not worry, saying, ‘What will we eat?’ or ‘What will we drink?’ or ‘What will we wear?’… But strive first for the kingdom of God and his righteousness, and all these things will be given to you as well” (Matthew 6:31, 33). In our culture, we place high value on success. Success is often measured by appearance, material wealth, occupation, or career advancement. All these are external areas of our lives. At Brethren Volunteer Service orientations, we invite Dana Cassell, pastor of Peace Covenant Church of the Brethren, to lead us for a day focused on vocation—particularly on what and how God calls us. During that time she shares a story from Henri Nouwen, who was at the top of his profession teaching psychology at Harvard, Notre Dame, and Yale, but left it all to work in a L’Arche community. It was a significant change to go from the halls of academia to closely serving persons with intellectual disabilities each day. During this experience, Nouwen learned three things: 1) Being is more important than doing, 2) The heart is more important than the mind, and 3) Doing things together is more important than doing things alone. 1) Being is more important than doing. But she was right. Listening is one of the most challenging things to do. We can be so preoccupied with doing something for someone that we miss the opportunity to listen, to be present. This doesn’t mean we stop the doing—we still need to get things done—but, like Nouwen, we must realize that in the push to achieve the pinnacle of success, we often lose an essential component of life—being with people. The L’Arche community taught Nouwen this, and that was my supervisor’s lesson too. Being is more important than doing. Listening is the most important thing you will do. 2) The heart is more important than the mind. Academic achievement certainly fits with our cultural value of success, and Nouwen certainly succeeded in this area as a professor at prestigious schools. However, he didn’t feel like he was supposed to be in those places. It was then that he asked God for a clear message about what to do next. After many years and an interesting call, he moved to a L’Arche community to serve alongside persons with intellectual disabilities. While this can be challenging work to say the least, it doesn’t require quite the brain power of an academic setting. Nonetheless, Nouwen felt fulfilled in that community and it was where he served the rest of his days. While the mind can be impressive, “love is where the heart is,” as the song goes, or maybe, the heart is where love is. 3) Doing things together is more important than doing things alone. As members of the Church of the Brethren, we understand this, and many Christians do too. We understand following Jesus means working together in community. Together. It does, however, run against cultural values of independence and success—being a self-made person, “pulling yourself up by your bootstraps,” and going it alone. One might think of things like Frank Sinatra’s famous line, “I did it my way.” We hear all the time about the success of someone doing something on their own, and it can be difficult to evaluate success when something is done together. Even though our cultural lens limits success to individual achievement, Nouwen still affirmed that doing things together is more important, and I completely agree. I can’t lead Brethren Volunteer Service by myself; we need our whole team. And we can’t be the church by ourselves or do the work of Jesus alone; we need each other, the whole community, to discern and move forward together. What Nouwen learned at L’Arche is still essential for us today. Instead of living for our own success, these principles guide us to be present, remain focused on matters of the heart, and value community. By embodying these lessons, may we more fully live into the kingdom of God. Brethren Volunteer Service partners with L’Arche communities in Northern Ireland, Germany, and the US. Learn more about this ministry of the Church of the Brethren or support it today at www.brethren.org/bvs. Hopeless. This was the word a man from the village of Kebalpur used to describe how he felt more than two years after the devastating earthquake in Nepal. 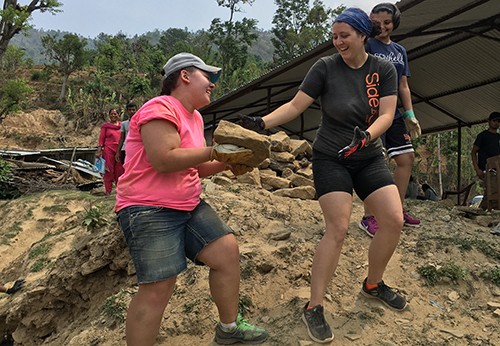 This summer, 16 of us traveled to the Dhading District of Nepal for the Young Adult Workcamp. We partnered with Heifer International to help rebuild two schools. Our time with the people of Nepal and their overwhelming resilience inspired me each day as we huffed and puffed up the mountain to our work sites. On our last day of work in Kebalpur, our translator offered to give us a tour of homes that were affected by the earthquake in April 2015. It was the house of the man who felt hopeless that we visited first. I distinctly remember approaching the house with a corrugated tin roof held down by giant rocks. There were no signs that any rebuilding had happened since the earthquake. A baby lay on a blanket in the middle of the floor and the man solemnly sat by the door as we had a conversation through our translator. Every interaction we had with people before this moment had been positive, happy, hopeful, and full of unspoken love. Over the last few days, we had laughed with the people of the village while we gave our best (unimpressive) effort to mix cement by hand, enjoyed playing kickball with their children and grandchildren, and even taught an elder of the village how to take a “selfie.” However, when this man shared with us, my entire perspective shifted. The reality of how this village was affected by the earthquake hit me like a ton of bricks. I was speechless. All I could do was sit in his doorway, listen, and be present. The workcamp theme for the summer was “Say Hello” and was supported by 3 John 13-14, which shares about having heart-to-heart conversations and greeting people by name. The theme focused on communication with God and each other, and even ourselves. While we were in Nepal, however, we were not able to communicate with people in their native language. But in our language of service, smiles, and holding space for people’s hopelessness, we formed relationships with people. We experienced what it means to be the church together and to work for the good of one another. Wherever we are, we are called to be the church not just in positive, happy, and hopeful times, but in difficult times of sitting in a doorway together and holding space for the despair that we see and feel all around us. When everything seems hopeless, we can share the burden and allow God to be present with us. The people we encountered in Nepal may not have been impressed with our cement mixing skills. But as we worked side by side, the way they welcomed us, showed us radical hospitality, and allowed us to be present in their hopeLESSness and hopeFULness was remarkable. It was one of the most significant images of church I’ve seen. 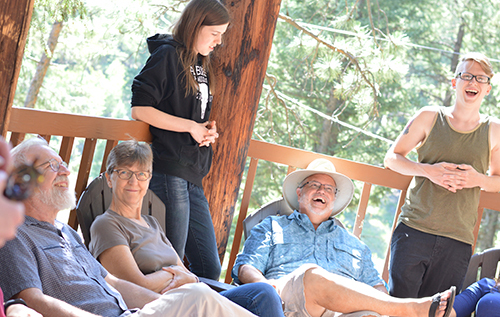 Workcamps provide opportunities for people of all ages to serve, worship, and learn together in community. Registration for the 2018 workcamp season opens January 11, 2018. For more information on workcamps visit www.brethren.org/workcamps or support it today at www.brethren.org/give.